Start your tour with a ride to the alpine town of Hanmer Springs and have a soak in the natural hot springs. Fall in love with Queenstown - the adrenaline capital of the world, bungy, jet boat,kayak or just chill out before heading to Dunedin - New Zealand’s Heritage and Wildlife city. Ride over the divine Lindis Pass and view Aoraki / Mt Cook from the edge of the incredibly blue Lake Tekapo, then loop back to Christchurch and the end of your 11 Day guided motorcycle tour. Christchurch to Hanmer Springs 134km/84 miles: Leave Christchurch and head north along the Coast Road to the thermal resort of Hanmer Springs - Enjoy the rolling Canterbury Plains and see Frog Rock along the way. Set in a basin of forest clad mountains and home to natural hot springs, Hamner Springs is where you can soak, relax and get in the holiday mood. Hanmer Springs to Punakaiki 260km/165 miles: Ride the spectacular Lewis Pass - a fantastic scenic ride and an old Maori greenstone trail. Stop at Reefton, a historic gold mining town for lunch then head to Punakaiki on the wild West Coast. See Pancake Rocks, incredible rock formations and blowholes were 30 million years in the making. Punakaiki to Franz Josef Glacier 216km/134 miles (4 hours): The West Coast road looks towards the Tasman Sea on the right and Southern Alps on the left. Known as 'The Ice Run', this road provides superb riding. The glaciers are an awe inspiring spectacle, amazing seen from the ground, and even more stunning from above. A helicopter can take you on a trip you'll never forget! Franz Josef Glacier to Queenstown 355km/219 miles (5.5 hours): Heading north on the Tasman coast road - wild and beautiful, we stop to sign a pebble on Bruce Bay - a Kiwi tradition! The scenery changes dramatically to native forest as we turn inland to cross the famous Haast Pass. Tumbling rivers, waterfalls and winding undulating riding. Again, the scenery changes as we enter central Otago and the Mount Aspiring National Park - we ride beside huge lakes with a background of snow capped mountains and cross the highest sealed road in New Zealand, the Crown Ranges and descend into the Adventure Capital of the World - Queenstown! Queenstown to Te Anau 173 km/105 miles (3 hours): Take a short, but stunning ride to Te Anau and see Fiordland's primeval landscapes. This is one of the few places on the planet the wilderness is still pristine. Waterfalls tumble hundreds of metres into forested valleys, the mirror surfaces of the fiords reflect the majestic towering mountains where the word 'silence' takes on a different meaning. Te Anau to Milford Sound to Te Anau 110km/68 miles each way (2.5 hours each way): Ride along the shores of Lake Te Anau, through the famous Homer tunnel, and down to Milford Sound. The mountainous views on the road to Milford are almost as impressive as the Fiord itself. Keep an eye out for kea, a cheeky alpine parrot with a taste for rubber and plastic. 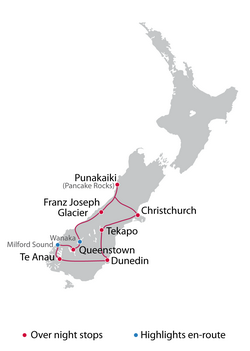 Your cruise around Milford Sound is included. Dunedin to Tekapo 434km/269 miles: Leave Dunedin for a great ride over the Maungatua Ranges. The area is typical of the dry Maniototo region - sparse, tussock clad, rolling hills. Stop at Cromwell the 'fruit bowl of New Zealand'. Then take on the Lindis Pass, the saddle with alpine landscape between Lindis Valley and the Ahuriri River to Lake Tekapo. Tekapo to Christchurch 274km/170 miles: Lake Tekapo offers breath taking views of Mt Cook, New Zealand's tallest mountain. At the Church of the Good Shepherd, admire the bronze statue of a sheep dog and views of the turquoise lake. Ride on to Christchurch via Burkes Pass, Mount Hutt and the Canterbury plains. Arrive in Christchurch and we relive our tour, say our goodbyes and make plans to return over a farewell meal!